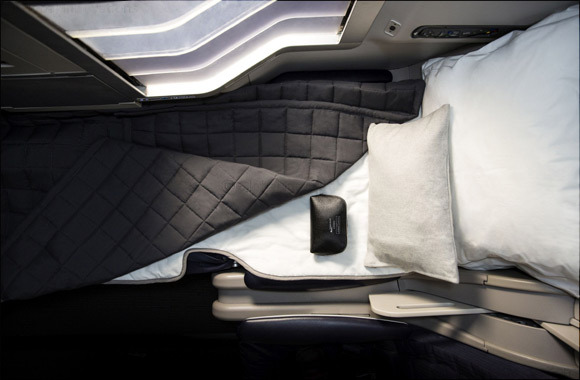 Kuwait, February 22, 2018: British Airways’ Club World customers travelling between Kuwait and London will benefit from an even better night’s sleep in the sky as the airline introduces its new bedding from The White Company from today. The airline’s Kuwait service is one of the first routes in the Middle East to receive the new luxurious bedding and amenity kits from the iconic British retailer. Kuwait residents flying Club World can will enjoy the airline’s new sleep products that have been exclusively designed by The White Company, including a luxuriously soft large pillow and white cotton pillowcase to enhance customers’ comfort and to help them sleep well in the sky. Customers will also receive a super-soft woven blanket with satin trim, a bespoke luxury duvet, and a padded mattress cover to give them an extra layer of comfort and improve their quality of sleep. The new Club World amenity kits come in a bespoke bag from The White Company and contain products from the retailer’s 'Restore & Relax Spa Collection' offering a further touch of luxury in the sky. The products have been specially selected to help counteract the effects of long haul air travel, each item is designed to provide a relaxing boost whenever customers need it during their flight. British Airways is also introducing a number of measures on board to maximise available sleep time for customers in Club World. Breakfast cards are provided so customers can select if they wish to be woken for breakfast and what they would like, or left to sleep through. Later this year, British Airways will also roll out its new restaurant style dinning service in Club World on its Kuwait service. The new Club World catering provides travellers flying between the two cosmopolitan cities a selection of freshly prepared starters and desserts that they can chose from display trolleys when flying at 30,000 feet. In addition to the £600 million being spent on Club World, at London Heathrow a new First Wing check-in area with direct security and lounge access launched in 2017, and lounges around the airline’s network are to be refreshed and enhanced. Additionally, all customers can look forward to the latest generation Wi-Fi across British Airways’ long-haul and short-haul fleets over the next two years.